There are FOUR new rubber stamp sets being released this month, plus a new Digi Papers set, and a Digi Only Bundle set full of lots of extras. When you purchase the digital versions of any of the SNS rubber sets, you are getting lots of extras that are not available otherwise. These extras can include additional images, sentiments, digi papers, and/or decoupage sheets that not available with the rubber version. 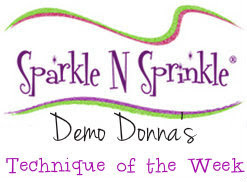 ~ a cut file to use with your electronic cutting machines! You're definitely going to want both the rubber versions AND the digital versions of all our new releases. 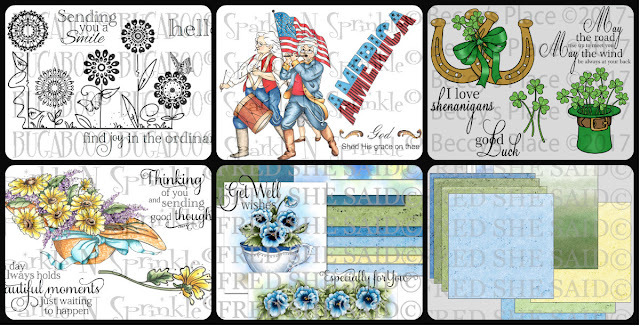 The new sets are 20% off until March 3, 2017, so after the blog hop, hop on over to the NEW STORE and have fun shopping - be sure to check out the OTHER amazing new products as well! With names like TONIC and STAMPENDOUS and HOUSE MOUSE, you're sure to fill that cart up quickly! On March 3, ONE GRAND PRIZE WINNER will be selected from the comments left on all the Designers' blogs listed below. 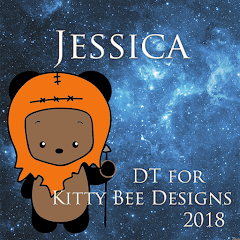 Please leave a comment with each designer to be eligible for the Grand Prize (checked for compliance). The Grand Prize Winner will be announced on the SNS Facebook page and the SNS New Blog. I fell in love with the Bonnet Bouquet Stamp Set and couldn't wait to try it out! I decided I really wanted to do the Cracked Glass technique with this card! First, I started by printing off the Digital version of the image (digi version - DIGI838J). I trimmed it to the size I wanted to use and then covered the entire image with Veramark Ink. I sprinkled on the Super Thick Clear Embossing Powder and heat set. I repeated the steps 2 more times to make a very thick, glossy layer of embossing powder. I placed the image in the freezer for about 5 minutes and then came the FUN! CRACKING! I gently cracked the frozen piece of paper until I got the amount of cracks I wanted. How fun and easy! I made the background by stamping the sentiment over and over. Then I applied some Aquamarine Embellishment Mousse to distress it. I stamped the main sentiment using Vesamark Ink and embossed with Black Detail Embossing Powder. All the layers were adhered with 1/4" Tear-ific Tape and I finished it off with some Sunlit Meadow Glitter Drops & Bright Metallic Gold Crystal Drops. The next stop on our blog hop is the amazingly talented Eret and you can find her blog HERE. I hope you enjoyed my card and our new release! Sometimes the simplest of techniques can make amazing cards! 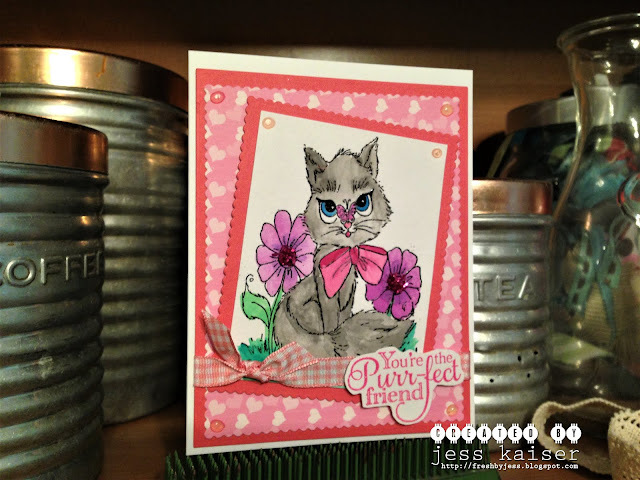 Today's SparkleNSprinkle card features the Sitting Pretty Kitty stamp set again! I started this card by cutting out my base using the Mixed Edge Oval Dies from Tonic Studios. Shaped cards are so much fun to make! I inked up my embossing folder using Versamark Ink and ran the front through my Big Shot. Afterwards, I sprinkled on the Orange Sherbet Embossing Powder and heat set. Isn't it a cool background? I stamped the image onto white cardstock using Versamark Ink, embossed with Black Detail Embossing Powder and watercolored it (I'm sure having fun watercoloring!). I used the Small Glue Pen to add accents of Sunny Daze Glitter to the flowers and Ballerina Glitter to the kitty's bow! 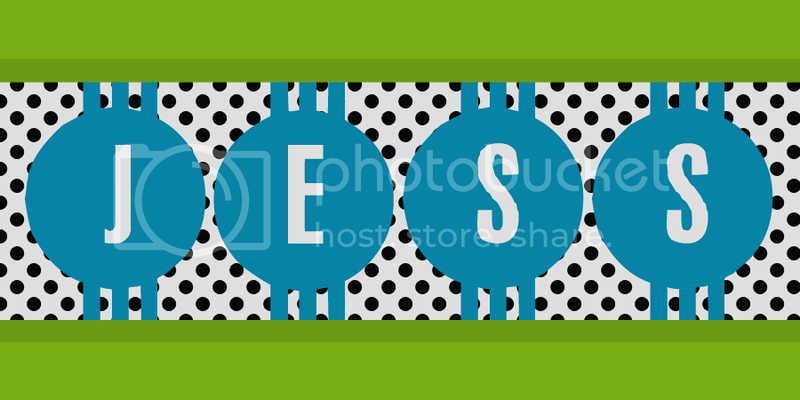 The image was cut out using Mixed Edge Oval dies. I added drops of Orange Marmalade Jewel Drops and set the image aside to dry completely. I cut another oval of pink cardstock and applied the Large Glue Pen to the outside edge, then sprinkled on the Peach Bellini Glitter, burnishing well. The sentiment was stamped with Versamark and embossed with Rosa Embossing Powder. All the layers were attached using 1/4" Tear-ific Tape. I added a bunch of ribbon to the side for a finishing touch! I hope you enjoyed this card - I sure had fun! 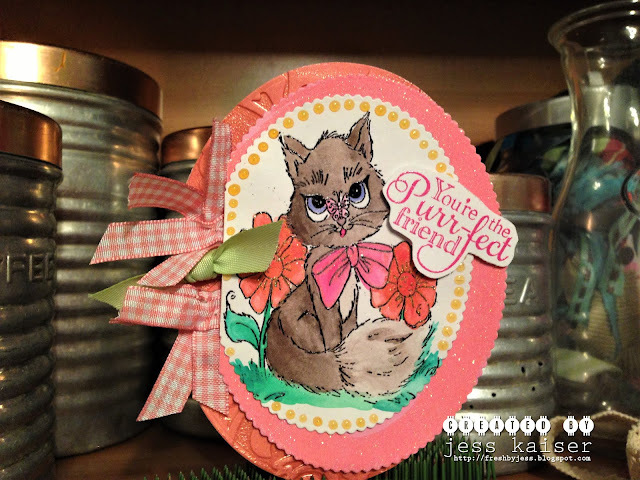 Today's SparkleNSprinkle card is featuring the Sitting Pretty Kitty Stamp Set! This adorable little pretty card was a snap to make! :) I started by stamping the focal image with Versamark Ink and embossing with Black Detail Embossing Powder. I grabbed my watercolor paints and got the image all prettied up! Soooo cute! To the centers of the flowers I used SNS Dimensional Glue to add Fuchsia Glass Glitter. SOOO pretty! The layers were cut using the Mixed Edge Rectangles and adhered with 1/4" Tear-ific Tape! Finally, a few Rose Water Jewel Drops were added for a final touch. 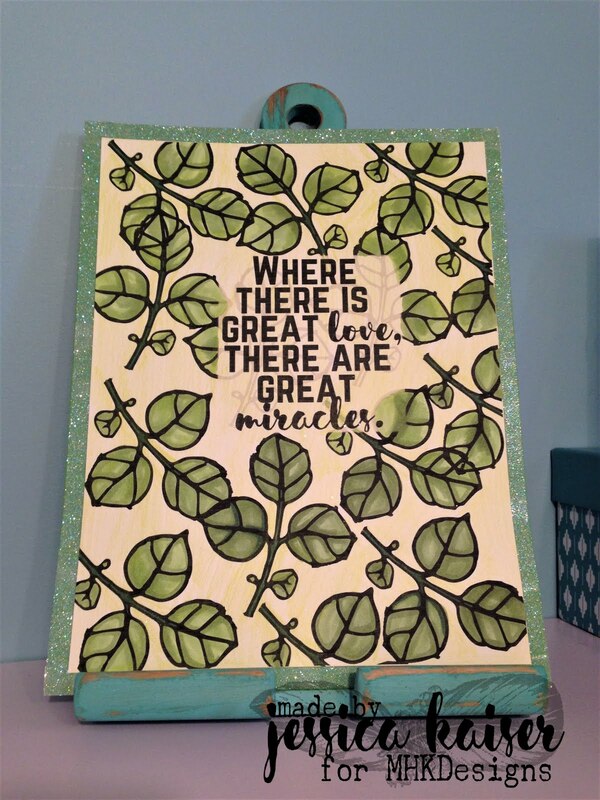 The sentiment was stamped using Versamark Ink and embossed with Rosa Embossing Powder. Welcome to our FINAL New Release of 2017 with MHKDesigns! 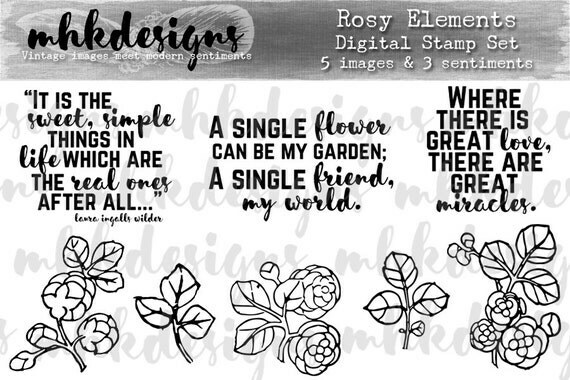 Our final New Release is called "Rosy Elements". I have another gorgeous card for SparkleNSprinkle today featuring the Leafy Spring Flower Wreath Stamp! First, I stamped the wreath image using Versamark Ink and heat embossed with White Detail Embossing Powder. After it was cool, I used a sponge to apply the Angel Pink Memento Ink all around the edges of the card front as well as all over the embossed wreath. This sure made the wreath pop out of the page! Next, I grabbed the Woodland Green Crystal Drops and squeezed some out on a palette. I took my aquapainter, carefully picked up some of the drop, then diluted with the water and painted the leaves of my wreath! Such a neat technique! You can water it down as much as you want to get the desired effect. Finally, to finish off the card, I added Rose Water & Limoncello Jewel Drops! 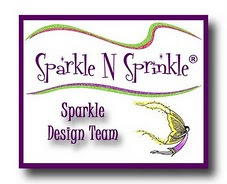 SparkleNSprinkle - Double the Fun!